Malposition of pacemaker leads has been described in several different locations, including the left ventricle, the coronary sinus and other cardiac veins, the atria, and the pulmonary outflow tract. The temporary pacing lead placement without fluoroscopic guidance may be dangerous and could prove fatal. A 50-year-old female was referred to our emergency with history of recurrent syncope followed by cardiac arrest for which she underwent temporary pacemaker insertion at a peripheral primary care center. The pacemaker was inserted through right femoral access without fluoroscopic guidance. After haemodynamic stabilization she was referred to our tertiary care center for further management. On examination, pulse rate was 60/min and regular. Blood pressure was 130/70 mm Hg. Cardiovascular system examination was unremarkable. 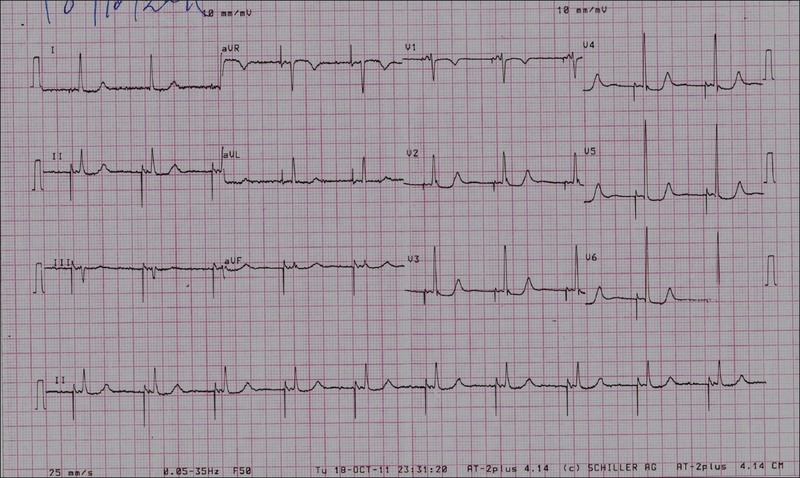 Electrocardiogram showed paced rhythm mimicking atrial pacing with short PR interval followed by narrow QRS complexes [Figure 1]. The QRS axis was normal (+45°). Echocardiography showed looped pacing lead in the ascending aorta. There was no pericardial effusion. Fluoroscopy showed temporary pacing lead, which traversed through the aorta and forming abnormal loops within ascending aorta with the tip facing downwards and engaged in the non-coronary sinus [Figure 2]a and [Figure 2]b; [Video 1] and [Video 2]. Vascular access sheath guide wire was also seen within the right atrium extending into superior venacava and inferior venacava. The pacing threshold was 5 Volts and she was pacemaker dependent. 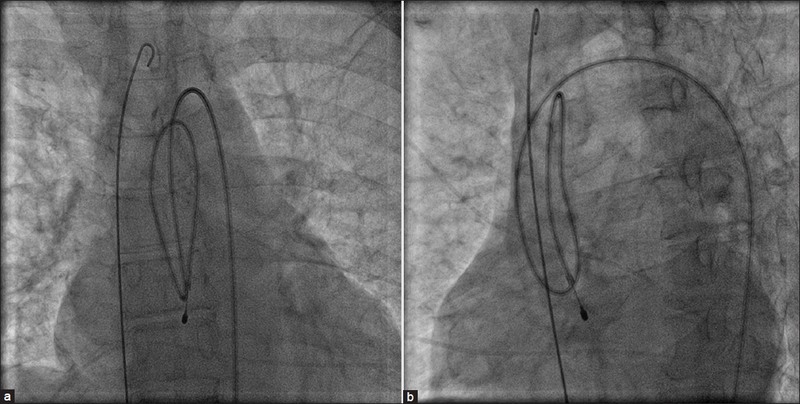 The patient underwent successful percutaneous retrieval of the guide wire using gooseneck snare [Figure 3]a and b, [Video 3] and [Video 4] followed by placement of trans- venous temporary pacemaker lead inside RV. Later the pacemaker lead inside ascending aorta was removed. Finally she underwent permanent pacemaker implantation through right subclavian vein access. Inadvertent lead malposition is not uncommon and there are several instances of placement pacing lead in left ventricle, coronary sinus, atria, cardiac veins etc. Some of those are related to cardiac structural abnormalities like septal defects. Such mal-positions may result in complications like inability to capture, cardiac perforation, valvular damage, thrombus formation with embolization etc. The malposition within aorta or left ventricle may be related to the faulty insertion through either femoral artery or subclavian artery. In patients with an atrial septal defect or patent foramen ovale (PFO), lead could be erroneously implanted in the left ventricle. , Dilated hearts, and abnormally situated hearts may make fluoroscopic examination difficult and misleading, resulting in malposition. In our patient, the temporary pacemaker insertion was done under emergency situation during cardiac arrest. Probably non-palpable arterial pulse and desaturated arterial blood might have resulted in insertion of vascular sheath into the femoral artery. Moreover, the procedure was done without fluoroscopic guidance due to non-availability. Probably subclavian or jugular vein could be a preferred vascular access option when doing such procedure without fluoroscopic guidance, since the distance to be travelled is short when compared to femoral access, thus, preventing the damage to vasculature. The diagnosis of an inadvertently misplaced lead is simple but requires a high index of suspicion. Careful analysis of the post pacing electrocardiography and chest radiograph could reveal abnormal position of the lead. In our patient, the electrocardiogram was showing pacing spike followed by abnormal P wave mimicking atrial pacing with short PR interval followed by narrow QRS complexes due to abnormal pacing at non-coronary aortic sinus. Non-coronary aortic sinus pacing can mimic atrial pacing but it may succeed in capturing myocardium as seen in our patient. 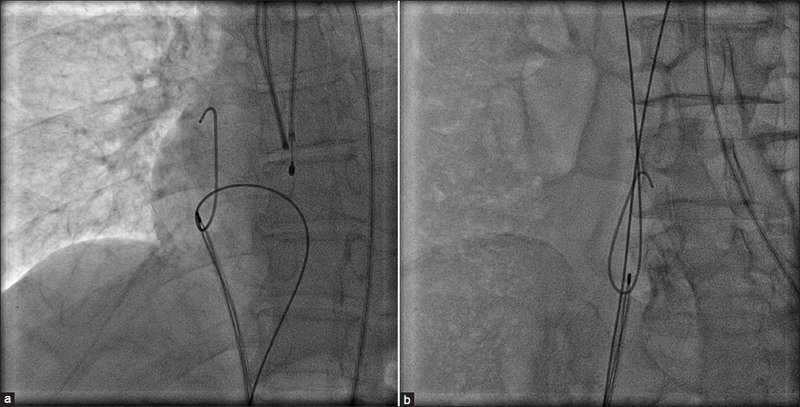 Our patient also had associated accidental embolization of the vascular access guide wire into right atrium; however, it was successfully retrieved using gooseneck snare. Inadvertent placement of pacing leads into abnormal locations is potentially dangerous. However, in emergency situations and without fluoroscopic guidance these complications do occur in inexperienced hands. However, subclavian approach should be preferred over femoral access in such unavoidable circumstances. Aortic sinus pacing may mimic atrial pacing but still may capture myocardium. Following pacemaker implantation careful analysis of the electrocardiogram and chest radiograph should be practiced compulsorily. 1. Dunbar RD. Radiologic appearance of compromised thoracic catheters, tubes, and wires. Radiol Clin North Am 1984;22:699-722. 2. Reising S, Safford R, Castello R, Bosworth V, Freeman W, Kusumoto F. A stroke of bad luck: Left ventricular pacemaker malposition. J Am Soc Echocardiogr 2007;20:1316.e1-3. 3. Erlemeier HH, Wolf W, Harland A, Schier H. Perforation of a temporary transvenous pacemaker electrode in the left hemithorax. Diagnostic value of echocardiography. Z Kardiol 1992;81:226-9. 4. Sussman SK, Chiles C, Cooper C, Lowe JE. CT demonstration of myocardial perforation by a pacemaker lead. J Comput Assist Tomogr 1986;10:670-2.